Unlimited CABLE INTERNET PLANS in the province of Quebec. Cable Internet service in Quebec is our best unlimited Internet service in Canada. The service uptime, the reliability and the speed consistency have surpassed all other networks we deal with. In conclusion, if you are looking for peace of mind with your Internet service, this is the place to get it! 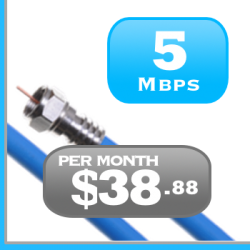 Always remember that all of our Internet plans come with unlimited Internet downloads and uploads! Our most notable mention about your Heroic Internet service is the word freedom. Hence you are free to browse and download all your hearts content. Anyone living in Quebec having access to the Videotron cable lines can choose from these Internet plans below. Get free installation when you pay for a year on most of our Internet plans!